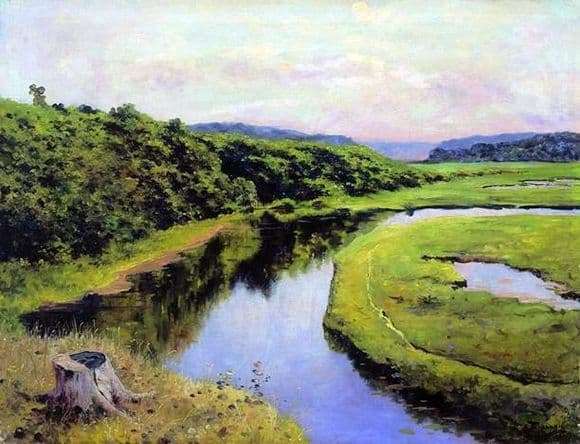 Polenov, very often refers to the water in his work, is no exception, and this work, which represents the audience the bank of the Oka River. In general, this river very often inspired the master to create masterpieces. At first glance, the picture does not show any harmony, but the artist presents the river in such a way that it makes it stop and at least take a closer look. The picture illustrates the sun and even though it is quite controversial, but most likely the autumn day, despite the fact that only a small patch of yellow grass near hemp hints at this, the artist loved the autumn and the majority of his canvases were made at this time of year. In any case, autumn has not yet entered full rights, so the river meanders between still juicy, green trees and hills. The reflection of trees in the water is not immediately noticed, but it cuts into the memory forever. In this work, the very meaning of autumn itself has been changed, because the yellow colors have not yet captured everything around, but everything is coming to this, and this does not stop, which is symbolized by a small patch of the meadow, which is already moving into the “autumn mode”. But this can not be noticed immediately, because almost all of the views, attracts the river to itself. The water in it is the purest, because of which it shows the reflection of the tops of trees, clouds and the sky as a whole. And again I want to note, despite the fact that the picture can even depict autumn even in fact, Polenov clearly makes it clear that it is still quite sunny and warm, so most likely, we can assume that we have “Indian summer”. The river is spread over the main part of the picture and you can even notice it in the background. Having admired the river as much as possible, it is not possible to immediately notice how the horizon is covered by beautiful mountains with tints from pink with its shades to blue.